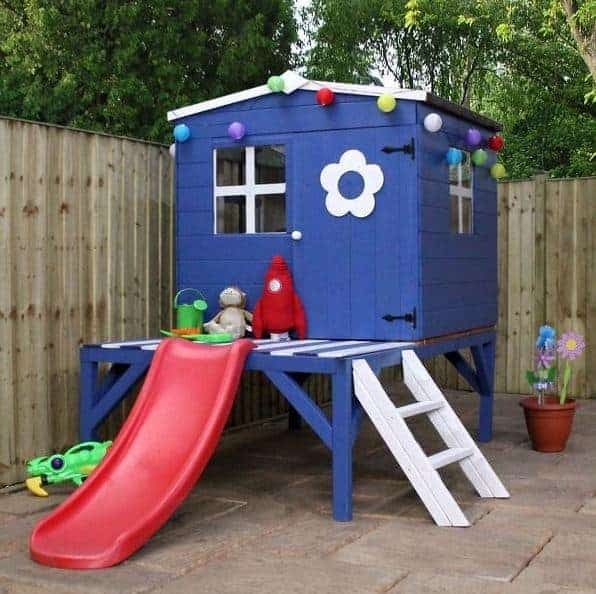 Keep the kids happy, playing outside and in general having the time of their lives with their teddies or their friends with the awesome, 4 x 4 Waltons Honeypot Bluebell Wooden Tower Playhouse with Slide. This is a very charming and low priced playhouse that offers a fun little house to play in. A wavy slide that they can go down or even throw their favourite teddy down and there is a nice little ladder round the side as well. The children will spend hours and hours having fun with this playhouse and you get to have fun too by watching them enjoy it. Even though this is a very reasonably priced playhouse, it is still very well made. 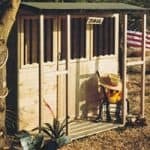 The walls are made with tongue and groove shiplap cladding which along with the very robust frame make this a structure that is able to take the rough and tumble kind of play that kids do. The roof and the floor are very strong and reliable and this is done without having to pass the cost onto you the customer. There is never any danger of broken glass as the two good sized windows are made from anti shatter styrene. 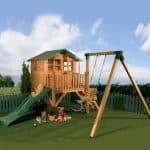 In all this is just a very fun, safe and long lasting playhouse that the children are really going to enjoy. The 4 x 4 Waltons Honeypot Bluebell Wooden Tower Playhouse with Slide you can tell from just a glance at the first picture is something that kids are going to have just an incredible time with. One other thing that makes this a great buy is that during the winter when it is too cold for them to play outside, you can use this to store all their summer garden toys. It is a very good size at, 4 feet 2 inches wide and 3 feet 9 inches deep which will seem large to the kids, but it will not take up the whole garden. The playhouse is not all that high with the very peak of the roof being, 5 feet 8 inches high and this is the very top of the roof so the playhouse is not that high off the ground at all. Speaking of which as you can see the playhouse is slightly raised just about a foot off the ground. There is a lovely little ladder on one side of the playhouse. 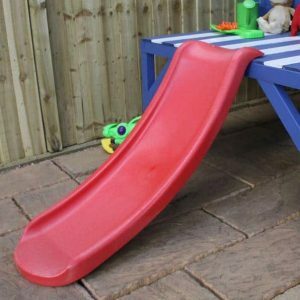 It only has two steps so it is safe for even very young kids. Once they have climbed up they can either go into the playhouse, sit on the decking or go down the slide. While it is not an advertised feature, we are sure kids will also have a lot of fun crawling around underneath the playhouse as well. There is an apex roof on the playhouse and it has been designed so that the water will not run off onto the decking which is something we like. 8 mm thick solid sheet boards, covered with sand felt is what makes up the roof and honestly we are pleased with the quality of the roof that is on here. Clearly this is a very charming and sweet playhouse, but what really took us by surprise was just how strong this cladding was. It is 12 mm thick and as it is tongue and groove shiplap cladding, no water is getting inside to spoil the kids toys. This thick cladding is going to ensure the playhouse can handle the rough play that kids love to do. You know what kids are like one minute there is a nice tea party going on, the next there is some kind of wrestling championship. Well this playhouse has been designed to handle a little rough play so do not worry. The frame is, 28 mm x 28 mm which greatly helps the robustness of the playhouse. It has double framed corners just like Waltons put in their sheds. The frame is not something the kids are going to care about. But you parents will love how strong and reliable it makes the playhouse. We were not too surprised to see that the same solid sheet boarding that is used for the roof is what they have used for the floor. However the boarding here is a little bit thicker at 10 mm. This is more than strong enough to take the weight of a Playhouse Disney themed dance party. Waltons have been very clever with this flooring in that they have made sure it is very robust, but at the same time they do not have to raise the costs because of it. A water based timber treatment will be applied to the wood and this is fine for the short term. 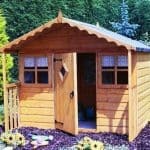 But within a week or two, you will want to coat the playhouse with wood treatment to make sure it keeps its lovely looks. So that it lasts their whole childhood or at least until they are too big to get inside, you will need to give it a fresh coating once a year. Waltons give you a very generous ten year anti rot guarantee with the playhouse, but for this to be valid, you do need to treat the playhouse. But as this is something you need to do anyway we do not see this as a negative at all. How can you not love that little door? Well we say little, but at, 2 feet 11 inches high and 1 feet 9 inches wide it is more than spacious enough for a child with their arms full of teddies to get inside. To keep the door from sagging and so that it can take the odd slam, Waltons have made sure to use very strong hinges. Of we cannot talk about the door without mentioning that fantastic flower decoration which is on it which we really love. As you can see there are two windows with one on the side and then one on the front. Rather than use glass, Waltons have used safety styrene so there is never any danger of broken glass inside the playhouse. These windows have a very nice little white frame effect to them which we think helps add to the charm of the playhouse. For what it is the, 4 x 4 Waltons Honeypot Bluebell Wooden Tower Playhouse with Slide is a very secure structure. Of course as this is for kids there is no lock on the door, but as they will not be keeping a bag full of cash or a laptop in here then there is no need for a lock. Playhouses and privacy are not really two things that go in common, but this one as the windows are not too large does offer a little bit of privacy. The kids may want to have a little fun by picking some fabric that they can place over the windows to either give them a little privacy from mum and dad always watching them or even just to keep the sun out. When it comes to customising the playhouse, we always feel that this is best left up to the kids. They can organise some toys, maybe even a plant on that decking so they can really make this their own. There are a couple of extras that Waltons offer with this playhouse. First for all they have a couple of upgrades for the roof. they have a 10 mm superior duty felt that is a charcoal colour for, £34.99. They also have another felt that is the same type, but an olive colour, this one is priced at, £69.95. To be honest we feel that the felt which comes with it is more than good enough and it is not like the kids are going to be able to see it anyway. The other extra that they have is an installation service which costs, £154.99. 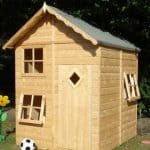 We are very happy with how high quality this playhouse is, especially when you consider the very fair price. We can see this lasting as long as the kids can fit inside it. These materials have been chosen because they can handle the kind of crazy and rough play that kids love to do. This is one of the smaller playhouses, but for very young kids it will seem like a mansion. Also its compact stature means it will not take over the whole garden. With the help of a friend we do not see you having any issues building this as it is a rather compact playhouse and it is a pretty straight forward build. We do suggest trying to build when the kids are not around as all you will hear is, is it done yet? Over and over again! At £279.95, we feel this is fantastic value for money. This is going to provide hours and hours of fun and even though the price is very reasonable the materials used in its construction are still of a high quality. 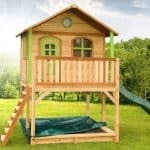 Final Thoughts: The 4 x 4 Waltons Honeypot Bluebell Wooden Tower Playhouse with Slide is a great way to get the kids to put down the iPad, get off the couch and have some fun outside. 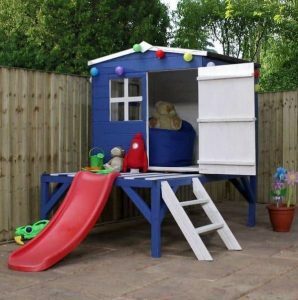 This is one of the most lovely little playhouses we have seen in quite some time and if you are short on space or do not want to spend several hundred pounds on a playhouse then this one is perfect. We are sure the smiles and the hugs that you get as well as watching them play with this will make you just as happy as they are that you purchased this. If you want a high quality playhouse at a very reasonable price then this one requires some serious consideration.